Great idea in principle, but this item is badly designed. The problems are firstly that the USB connector isn't held firmly in place, so it's a bit fiddly fitting a device onto it. Secondly, even with the USB connector lowered to its fullest extent, the base of the phone isn't in contact with the dock. So it's free to wobble about. I am worried that this will in time cause wear to the USB socket on the phone, so I have addressed the problem by adding some rubber pads to the base. This shouldn't have been necessary. I love what I ordered...very useful and easy. Great idea for my Blackberry Priv..I could multitask while its in the cradle charging dock and could easily see what I'm doing without the hassle of cords in the way. Very solid product, convenient and adjustable for phones with a case. The concept of this charging dock is OK but there are real issues getting the phone on and off the charging point. It is far too tight attaching the phone is a two handed job. I am using the Priv as an alarm clock while it is changing with rules for night time notifications It's working fine and is convenient. The cradle works well with my phone. My phone fits nicely into the cradle both with and without the phone's protective cover. It provides just the right angle so that I can leave the display on to view alerts and messages while it is charging. I think the cradle would work with any micro USB phone with a bottom connector. I really like this product because it stands my phone up next to my monitor. I used to have to pick my phone up whenever I received a notification by now with my phone standing up I can just look over and see it. The dock feels sturdy in your hands and I personally think is well worth the cost. The many varieties of the product ranging from apple phones, android ect. Sent me to buying one after my friend showed me his. I think it is very good for making your setup look cleaner and removing cables for phone power. It is also a very good item because it can connect your phone or tablet to your PC via the usb cable it uses to charge. One tip with the dock is that you don't need to raise or lower the port to successfully and easily charge your phone at any time. Also the dock takes 2-3 seconds to start charging your device so don't worry about that, but once charging has commenced the device will charge without fault or hinder. This charging deck works pèrfectly and is extremely adjustable. However, my main problem with this device is that the One plus One has the USB connector in a reverse position. So that when I connect it to the base, the phone is not face forward, which is a pity. Item is fantastic. Not only does it charge my phone but it also charges my bottom charging vape as well. Was a bit expensive but I doubt it will need replace any time soon. Speedy delivery as always. The charging dock works....i.e. it docks the device and it charges it. 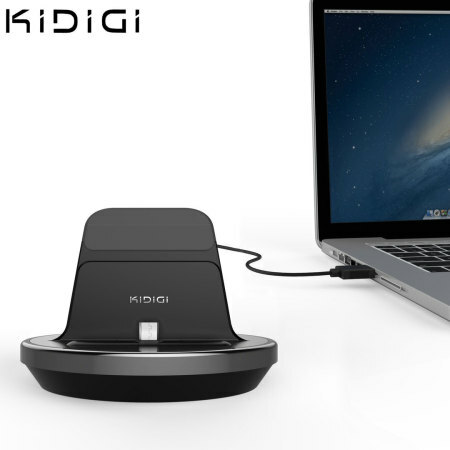 I have purchased Kidigi docks before and they have been superb. I was not so impressed this time. The construction is solid enough but there are limitations in the design. Thier earlier manifestations were model specific so the seating and general fit were snug and firm. This generic version suffers just a little in trying to be everthing to everybody. There are no comforting side walls and the earlier versions had four non skid rubber feet which did a better job of preventing slippage when working on the phone when docked. This brings me to my last point. the recline angle is shallower by a few degrees than in the model specific incarnations and therefore not so comfortably usable when inputting data by stylus and checking calendar etc. However having said all this I am keeping the dock as it does what it was supposed to do very well with a very stable 100% solid connection for data transfer and charging. A compact and modern desktop charging dock for you Samsung Galaxy S7 /S7 Edge can also be used for several other Samsung mobile phones and other products. With a height adjusting docking point for equipment requiring a longer contact / connection. Sleek circular design with a support for your phone U.S.B. connectivity to your laptop and computer system an all-round charging system for your desk / office.